Finishing up the final day of E3 2017 was a quiet appointment with Konami to see one of their two major titles this year. While the announcement of a new Pro Evolution Soccer is sure to excite players across the pond, it’s the upcoming Metal Gear Survive that caught my attention. Metal Gear Solid V: The Phantom Pain was among my favorite games of 2015 and I was excited at the prospect of another game taking advantage and using all of those complex and interconnected mechanics. Taking place in a desolate wasteland, far away from the comforts of Mother Base, our four person squad was given the simple task of defending an electronic installation against increasing waves of Wanderers and all manner of humanoid creatures. Our experience first opened with a brief tutorial on the mechanics and the option to pick one of four preset load outs, which Konami assured us was just to get us on our feet that much quicker, as the full Metal Gear Survive experience won’t feature traditional classes or presets. I stuck with one that could cover most of the basics: mid- to long-range assault rifle, pistol, (useless) slingshot launcher, and electric stun baton for melee. Before the mission began, we were taken to a virtual firing range where we were given the opportunity to test out controls and see the different mechanics all come together to get a feel for synergy with the weapon diversity. 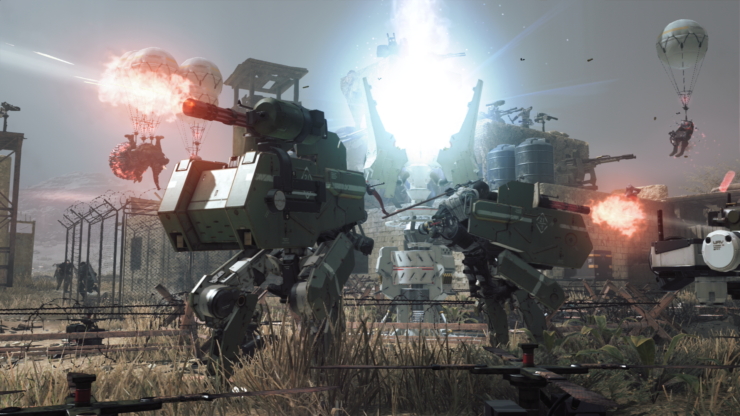 Metal Gear Survive features a fairly slim amount of base building, with the structures already put together for the defense point. What our squad had control of were more of the specialized structures, like fences and sniper towers. Building the usual walls to stop the invading waves was typically the first priority for every member of my team, while I set up a couple of sniper nests in order to provide some longer range support (mortars, in particular). Resource management, at least early on, felt rather tricky and our materials were finite more than I would have expected, but this should be common in a proper survival game. This made the other essentials like crafting ammo less of a priority until much later in the mission in comparison to impeding the waves through defensive walls and fortifications. At a quick glance, I wasn’t able to see if any of those ammo types actually matched what guns I had equipped and felt like I was blindly picking what I thought would’ve been the most common of assault rifle ammo (5.56mm, of course). Once it was crafted, there wasn’t any real indication of how I even equip what I just crafted and was instead left beginning the next wave with little more than my secondary firearm, some silly little slingshot that didn’t have any immediate effect, and a melee weapon that was my only reliable friend in the later waves. That is until I branched out for a quick little side quest. Inside the defensive base were a number of crafting stations, one of which allowed the opportunity for crafting various classes of ammo. 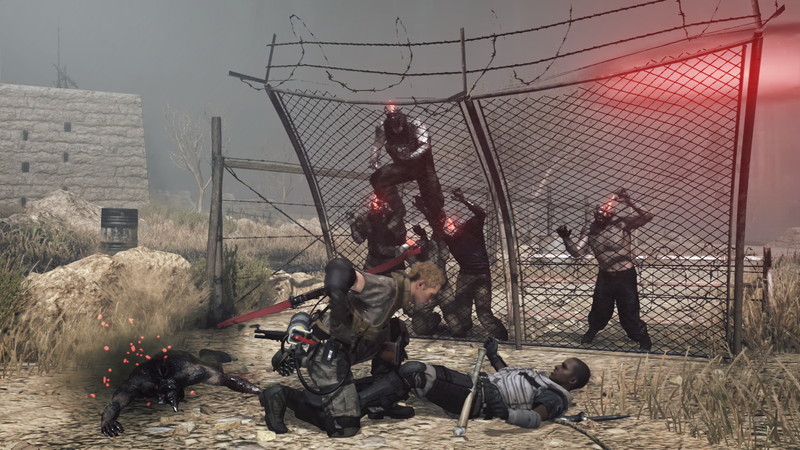 With ammo being utterly finite and quite easy to burn through with a fully automatic weapon, knowing when to take advantage and replenish between waves feels like a crucial part of the Metal Gear Survive experience. I am admittedly awful at Call of Duty’s Zombies modes, where I use my guns in the early waves versus the knife when it’s still viable. I could see how skills could carry over between the two games even though Metal Gear Survive asks for a more tactical approach out of its players. In between waves, Metal Gear Survive expects the player to be productive and prepare for the next wave of enemies. Whether this is in crafting, refreshing the base structures, or laying down new obstacles, there’s always something to do. If you’re feeling ambitious, something our guide referred to as side quests would spring up around the world, indicated by a wide blue mark on the mini-maps. Within were usually some higher level enemies that would prove to be a challenge for a solo player. Clearing them out typically lead to fresh loot and materials, but one held an exceptionally useful bonus: a Walker Gear. For most of the remainder of our match, I took the lead and ran out to take out the zombie threats. 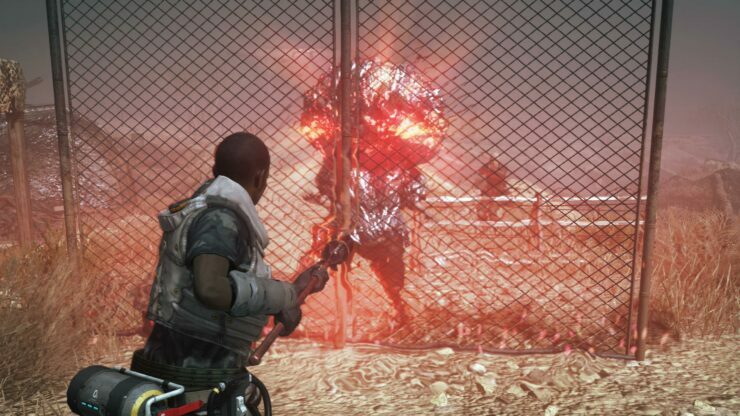 The feel of simply running up and side-kicking your way to victory feels amazing, although I had to be careful not to do the same to the Bomber, Metal Gear Survive’s version of a walking bomb. I made that mistake once and my poor walker gear blew up, leaving me incapacitated until one of my teammates could resurrect me. I was somewhat cautious on the prospect of a cooperative survival title being connected to Metal Gear, but after having played through Metal Gear Solid V: The Phantom Pain and loving every minute of it, I knew that engine could put in some work. I was already a huge fan of the multiplayer missions to Peace Walker (Isla del Monstruo in particular) and knew that creating a strange synergy with survival and the FOX Engine could actually turn out pretty decently if the team could pull it off. While my time with Metal Gear Survive was brief, every minute of it left me wanting more. 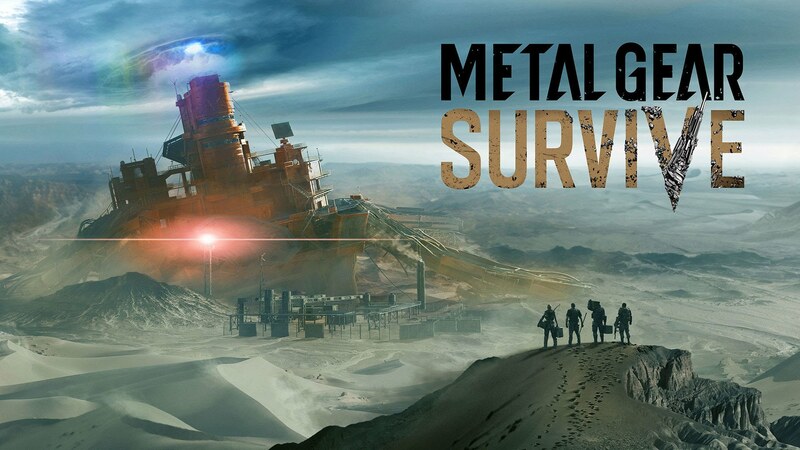 Metal Gear Survive is among my top favorite titles to have the opportunity to check out firsthand, and I’ll be picking it up on day one once it arrives on PC, PlayStation 4, and Xbox One in early 2018.